Most of the month was taken up with building a new recording studio 'The Bunker' The whole process was filmed and available to view on YouTube Here. Ian also performed his first solo headline gig on the 26th Sept at the Wonky Stuff Night. Recording continued with the JJK's and Vince Morgan, Ian also found time to play Accordion for The Silents on the 23rd June. 10th May Ian played what is to be the last Katie and the Questions gig for the foreseeable future at Leeds EMOM, then overdub and mixing sessions started for the Juke Joint Kings album, recording sessions for the forthcoming Vince Morgan album continued. The end of the month was taken up with recording a Dance project for a regular client. Most of the month was taken up with recording sessions with various clients for Pocklington Music. The Juke Joint Kings recorded at Fairview and started overdubs at the Pocklington Music recording studios, the album should be finished by the end of Summer and will be released on Ian's label Sinners Music. Ian starting planning recording sessions for the Juke Joint Kings by visiting Fairview Recording Studio where the principle recording will take place (sessions are scheduled for April. Ian also started work on his Bevin Boy coal mining project. Ian release the final part of the Bristol Trilogy on the 24th November. The triple album is available on all streaming and download sites Apple Music, iTunes, Amazon, Google Music, Deezer. Ian spent most of September and October putting the finishing touches to the third album in his Clifton Hotel Bristol Trilogy. Bristol 3 can be heard here. He also found time to visit SynthFest 2017 and present one of the awards at the Yorkshire Gig Guide Grassroots Awards. Recording on Ian's Bristol 3 album continued throughout the month, Ian took time out to spend his birthday at Edinburgh Fringe Festival in Scotland - you can listen to his Audiophile radio show about his visit here. Ian also bought a Teenage Engineering OP-1 synthesiser, his first experiment with it was streamed live - see the video here. Rehearsals started with a new Katie and the Questions band featuring a fantastic group of musicians, the group are planning to play festivals over the summer. Work also started on the remastering of Ian's first album Aleatorical Alchemy which will have a worldwide digital distribution on the 1st May 2017. Ian took delivery of a Roger Linn LinnStrument MPE midi controller from America, he can be seen playing it here. Ian spent the early part of the month writing and recording demos for the next Katie and Questions album, he also found time to record sessions for a couple of new clients at Pocklington Music Studios. The main part of the month was taken up with mastering the rinnan album which was released on the 24th December which is a double CD and available as a free download until the end of January 2017. Ian also managed to record some voiceover work for a new client. Work continued with Wave Prophets before Ian started preparation on his next solo album rinnan. Ian also found time to start work on a 2 hour dance project. The early part of the month was taken up with a visit to Edinburgh Festival Fringe where Ian recorded some interviews for his Audiophile radio show (listen here). The rest of the month was taken up with mastering Chris Brearley's album which is due out on the 18th September. Ian's album The Clifton Hotel (Bristol 2) for Cello & Moog was released on the 8th July. The first video for the track 5:27am is available here. Katie and the Questions played two festivals on the 24th (Dunnington Live) and 30th July (Pocklington Festival). Recording and mixing continued for Ian's Bristol 2 album, along with a mastering project for Malcolm Oxborrow's album Ocean of Reason's which has been unavailable for a while and can now be downloaded via the link. Ian also worked on Chris Brealey's album which is nearing completion and should be available in September. Rehearsals for the July Katie and Questions gigs started with new musicians to complement Ian and Kirsty's set of songs. Ian started the final recording of his latest solo album named The Clifton Hotel (Bristol 2). This is a companion piece to the 2014 album The Clifton Hotel (Bristol 1), mixing will start in early June with the release date set for the 8th July 2016. Ian also found time to re-mix and master two albums by the East River band Is there Really Love? and Finale! Recording sessions for the Katie and the Questions next EP were conducted. You can listen to a rough demo of Wonderland by clicking on the link, Ian also found time to record a concert for Chris Brealey that is to be used on his forthcoming album release. Most of the month was taken up with client recording and pre-production on the next Katie and the Questions EP. Ian spent the early part of the month putting the final touches to the Only Shadows Moves album release for Sinners Music Publishing before jetting off to New York to do some recording in the Big Apple, demos can be listened to on Ian's Soundcloud page. Ian got down to work on mixing and editing the album with David Martin titled Only Shadows Move, the album is planned for release on the 14th Feb 2016. Ian also recorded a 2nd demo session with Iona Kaye for Sinners Music Publishing with tracks being played on West Wolds Radio. Recording sessions continued throughout the month with Ian starting working on demo's for a new brilliant female singer songwriter. Ian started preparing for his new two hour radio show on West Wolds Radio. The radio show (which started on the 9th Dec) is called The Audiophile and is a music and arts radio programme focusing on local music and music Ian likes to play, it is broadcast every Wednesday evening from 8pm until 10pm (Live streaming here). It is also available to listen again here. Ian also found time to release his 5th solo album on the 24th Dec based on recording he had done back in August 2015 while staying in London. The album is free to download until the end of January 2016. September was taken up with rehearing and then performing with Katie and the Questions at Bealby Festival, a 40 min set was recorded by West Wolds Radio for future presentation. Part of the month was taken up with the principle recording of an Ian J Cole solo album to be released on the 24th Dec 2015 - available here. Katie and the Questions performed an acoustic set on the 19th July in Bealby Church as part of the Pocklington Music singing pupils summer concert. The month was taken up with recording sessions and rehearsals for short concert set by Katie and the Questions in Bealby Church. Ian continued to work on recording projects throughout the month with Chris Brealey and Diesel Dave. He also found time to record some new demos in London which can be listened to by following these links Wharfdale, Battlebridge Basin and Lighterman House. Katie and the Questions (Ian and Kirsty Grice Venour) performed a well received electronic synth, vocals and ipad set at Simply JJ's on the 26th of April as part of the Pocklington Littlefest. Katie and the Questions started preparing for their first performance of 2015 which is scheduled to be on the 26th April at Pocklington Littlefest. Ian also started working on comic song-smith Chris Brealey's debut album with this work due to continue into the summer. 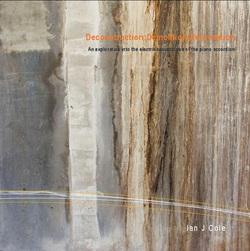 Ian had three tracks remixed from his second album Deconstruction:Demolition:Reinvention for Framework Radio on Resonance 104.4fm. He also found the time to be a judge on Pocklington's talent contest PockIdle which was sponsored by Pocklington Music. The month was taken up working on the music and audio editing for the Elliot School of Dance 2015 production which was performed in early March. Ian started work (with Kirsty Grice Venour) on writing and recorded demos for the next Katie and the Questions release which will be an EP scheduled for release towards the end of Summer 2015. Ian recorded and mixed the first track for Sinners Recording Artist 'Diesel Dave' who will be releasing a single in Spring 2015. He also released a free download album 'Cities' just before Christmas. Ian performed at Sonophilia 2014 Lincoln's Festival of Sound as part of Sonic Arts Forum on the 24th October. He performed three pieces A Summers Day and Demolition from his 2012 CD Deconstruction:Demolition:Reinvention and 4:50am from his current album The Clifton Hotel (Bristol 1). A recording of the performance is available here, Ian also participated in a improvisation session with fellow musicians. You can listen to the results here. Ian again taught an Introduction to Creative Music Technology course for Pocklington Music and started preparing for the first public performance of material from The Clifton Hotel album, which will be at the end of October as part of the Sonic Arts Forum at the Sonophilia 2014 Festival of Sound (23rd to 26th Oct). Ian's performance will be on the 24th at 11:10am. Ian spent the early part of the month having a holiday by visiting family in London. The latter part of August was taken up the the release of Ian's third solo album The Clifton Hotel (Bristol 1) which gained lots of interest and a fantastic review in YorkMix. The album was released on the 31st of August and can be purchased here. All 13 demo songs had been recorded on the comic album project so Ian spent most of the month editing,mixing and mastering the demos. The finished recordings were handed over to the client just before Easter. Work started on a new recording studio project in Pocklington, the recording of 13 demo songs for a forthcoming album of comic songs for a client. Ian also managed to fit in more work on the Clifton Hotel 1 album. Ian took the month off to recuperate after an emergency eye operation over the Xmas holidays. The gig with Hazel O'Conner on the 1st of the month was a fraught panic stricken affair with Hazel (who was lovely) taking up everybody's soundcheck/setup time by messing around with the lighting for hours. The gig itself was great fun with Katie and the Questions making new friends and selling CD's to boot. The other main highlight of the month was Ian was asked to review the Aesthetical Short Film Festival (7th-10th) for YorkMix Magazine you can read about all of the 4 days here. Ian taught an Introduction to Creative Music Technology course for Pocklington Music. Katie and the Questions had been asked to support Hazel O'Conner at the Brudenell Social Club in Leeds on the 1st Nov, so most of the month was taken up with rehearsing a new electronic version of the Katie and the Questions band featuring Katie Stewart, Wayne Britcliffe, Ian and a laptop. Ian spent a lot of time throughout the month re-recording, editing and mixing a two hour dance show for a client. It was also planned that Katie Stewart and Ian would perform an acoustic Katie and the Questions gig at Pocklington's Little Fest but this show had to be cancelled due to illness. On the 9th of June Ian was invited to a Music Trade Day where he had lunch with Gordon Giltrap and filmed (Oliver Dawson) Saxon performing. Ian spent the early part of the month remastering a 1973 vinyl album for Sinners Music Ltd and finishing off the recording studio at Pocklington Music. The studio is now fully functional - prices can be viewed here. Ian also released a free download of Belfast an electronic piece created with Max/MSP and a Korg kaossilator. A new year brought a new venture - Ian along with his wife Jane bought Pocklington Music, a retail shop and music academy. Ian set about remodelling two of the upstairs rooms into a recording studio while Jane took on the role of Shop Manager. At the beginning of November Ian was asked to cover the Aesthetical Short Film Festival (8th-11th) for YorkMix Magazine and he managed to watch 75 films in 4 days. You can read all about it here: Day1 Day2 Day3 Day4. The Katie and the Questions album 'Answers' is finished and going through the final stages of print design, you can have a sneaky listen here. Most of the early Sept was taken up with the re-vamping of Ian's recording studio The Audio Clinic. There is a full history dating back to the start of the Audio Clinic in the 1980's. The studio now offers an analogue and digital transfer service, so if you need any old 78's, vinyl, cassettes or any other media inc wax cylinders check out the website. Work in progress videos for the Clifton Hotel project will be appearing on YouTube this month so subscribe to the Sinners Music YouTube channel for e-mail updates as to when these videos come online. Ian spent the beginning of August at the Edinburgh Fringe Festival reviewing 36 shows in 7 days for YorkMix magazine, you can read about his exploits here. The rest of the month was spent mixing and mastering Katie and the Questions first album 'Answers' for Sinners Music Publishing.The album will be out later in the year and here is where Ian explains to a music industry panel how the album was made (scroll to 48:40). Ian has also been building a Cajon just for fun. Ian has recorded the Ebor Vox procession as it marched through the streets of York on the evening of the 9th of July the resulting album can be downloaded free from here. Read Ian's YorkMix column on the new wave of York novelists. Ian has a new video for his composition FireDance watch it here. Ian has started work on a new experimental piece based around a 3 hours and 14 minute recording of a rain storm, the work in progress version of the first 6 minutes can be listened to here. Ian will be playing with Katie and the Questions at the FoxFest in Holgate, York on the 26th May, on stage around 5pm. The rest of the month is taken up with the recording and mixing of Katie and the Questions first album 'Answers'. Ian has written a couple of pieces for the YorkMix Magazine one on Musicians getting paid and one on the failings of Eurovision. Ian's has been ask to write a regular column for new web magazine YorkMix and decided to write a piece on a Steven Severin Laptop Performance that he attended a few weeks back - Read it Here. Excellent. the sound sources are so processed as to be unrecognisable. The use of the vocal is superb. Sounds faintly islamic! 5/5. It's got a whole church vs ZX spectrum thing going on. The variation in the central set of tones makes it sound less obviously accordion. 5 stars. Ian's piece Deconstruction was performed at the International Streaming Festival 1st to 18th Dec 2011 and has now been added to the Festival's Permanent Collection -Click on the above image to visit the Festival site.